Former Vikings defensive end John Randle has many fond memories of the Metrodome and considered it his home. EDEN PRAIRIE, Minn. — "The stories this building can tell." It’s been one of the familiar phrases over the past few months in the final Minnesota Vikings’ season in the Metrodome. The home to the Vikings since 1982, the dome has seen its share of big games and crazy moments. Minnesota will move into its new indoor stadium in 2016 after a couple seasons outside at TCF Bank Stadium. With one game left in the Metrodome in Vikings’ history, we decided to ask the players that made those "stories" about their favorite memories of the 31-year-old building. The Metrodome was always known for one thing, during the ups and downs of the Vikings’ history: the noise. Receiver Randy Moss’ arrival to Minnesota in 1998 added to the rowdy atmosphere in the Dome. MOSS (a Viking from 1998-2004, 2010): "I remember the first game in the Metrodome against Green Bay. I was talking to Freddy Zamberletti. He couldn’t hear me, so I pointed at his ear. I said, ‘What you doing with ear plugs?’ And that’s when he said, ‘Huh? Huh? Huh?’ It was just so loud, the Green Bay games in that Metrodome throughout the years, so loud, packed to the roof, you could just see the atmosphere was just crazy and that’s one of the best memories I have in that Metrodome." Defensive tackle KEVIN WILLIAMS (2003-present): "That playoff game in ’09 when we played Dallas, that thing felt like it was floating in there it was so loud. The main thing is the crowd there. When the crowd is behind us, it’s an awesome building and it’s really loud. I think if you look at some stats, that crowd has probably forced more false starts and penalties than a lot of these stadiums in the league. It’s definitely served its purpose and been good to us." Hall of Fame offensive guard RANDALL MCDANIEL (1988-99): "You could see the change. I think the crowd’s got younger in the Dome, got a little more boisterous. They were always loud, but it seemed like as the years went on they got even louder. It was fun to see. I was just there recently and even with the way the season is going now, the fans are still just as loud or louder. They’re cheering no matter what. How can you not? It’s just fun to see. I had fun standing on the sideline watching the team and turning back and looking at the stands and seeing the full house, it was fun to see." Safety ROBERT GRIFFITH (1994-2001): "I just remember having an unfair advantage here because of the noise. You see all these studies where they have the meters where they’re going to Arrowhead, Super Dome and all that, but if they would have done that here at the Dome, I think we would have won that. It’s probably the loudest place I played in. So I knew on defense, we always had the advantage." 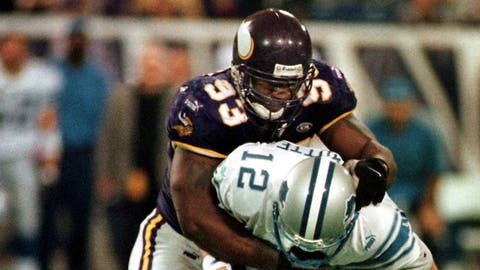 Hall of Fame defensive tackle JOHN RANDLE (1990-2000): "We had a huge one. As a defensive lineman, I couldn’t hear anything, and I know the offensive linemen couldn’t hear anything. You see those guys holding hands, trying to do a silent no count, touching each other or whatever, it was a big advantage for us." Kicker RYAN LONGWELL saw both sides by playing with the Packers (1997-2005) and then Vikings (2006-11): "We felt we had some really, really good teams coming over here and just could never, ever communicate because it was so loud. The volume in that stadium, when the fans get rocking, you can’t even have a conversation on the sideline. It wasn’t just the snap count and the communication on the field; it’s trying to communicate on the sideline to fix something, and you just couldn’t do it. We always felt we’d come over here and just struggle to communicate and walk out of here with a great team and a loss. It was just one of those things where it was a very difficult place to travel to. Obviously, it got into our heads a little bit. Very, very difficult." Head coach LESLIE FRAZIER remembered his first game at the Metrodome, as a member of the Chicago Bears: "Loud, loud . . . and the turf. The turf we have now, way better. It was tough going back in those days, but it was like that in most of the stadiums around the league. But the noise for sure, yes." The turf, especially in the early years, certainly played its role in Minnesota’s teams. MCDANIEL: "I was an Arizona kid. The dome was great. As far as a lineman when you’re chopping and cutting guys and doing all that stuff, you hit every play. The old dome stadium, the turf, was not the best to play on. It was a little rough on the body. The new stuff they come up with nowadays is a lot better. I missed out on all the good stuff. You had a dome for that reason. I didn’t like the turf, but I did like playing inside. If they could have put grass inside it, I would have loved it even more." Hall of Fame defensive end CHRIS DOLEMAN (1985-93, ’99): "It’s going to be a bittersweet time. I enjoyed the Metrodome. I really did. I enjoyed the turf, the fast field, the fans. That intimacy you had with the fans at either end of the goalposts, it was literally, you were a few feet away from them. Those are all things that you miss going in here with a new stadium. Right now, it seems like all these stadiums are these super buildings to host these games. It seems like the fans get further and further away from the field of action. But they do what they’ve got to do, I guess." JARED ALLEN (2008-present): "I personally love playing on grass. That’s football to me. Now I don’t like playing in the cold, so I love the Dome. But it’s a consistent surface. You don’t have to worry about conditions. So it is a little easier, in that circumstance. But you know, people always talk about, ‘Well, this is a fast surface.’ Everybody’s playing on the same surface. If conditions are bad, it’s bad for everybody." GRIFFITH: "We played on real turf with tennis shoes, so it was a little different. I liked playing in my tennis shoes." LONGWELL: "We always cherish good footing and this game as a Packer was late in the year, we thought it was a good advantage for us not to have to play in Lambeau that weekend so coming here was great. It was weird kicking field goals here as the home team with the stadium quiet. Because every time I would kick as a Packer people would be screaming. So, I certainly appreciated what it did for my career, good footing, no wind and I had a good run here for the six years I was here." IRWIN: "There’s some real good memories in here; some good football teams. I think the difference is the teams, as we moved into the Metrodome, they sort of lived more off speed than the teams before we moved into the Metrodome. That wasn’t good for me; I wasn’t a speed guy — can’t hit what you can’t catch. It made the pass rushers better." The Metrodome was one of several domed stadiums built during the ’70s and ’80s and one of the final ones left standing. The amenities naturally aged along with the stadium and left some players wishing for some of the benefits that have come along with newer stadiums. Some, like former offensive tackle Tim Irwin, never liked the Metrodome. Others just believe the Dome fell behind the times. IRWIN (1981-93): "I did not like playing in this building; Couldn’t breathe here. I think it was the same phenomenon in Detroit, which is the sister stadium. I loved the atmosphere, I’ve got great memories here, but I don’t have too much to say good about being a player in this building. I’m ready for them to knock her down. I think it’s something to do with the pressurized ceiling and it’s all packed in. it starts out, you go out two or three hours before the game and you walk around and it’s nice and cool. And then they fill it with people, it gets hot real quick. It was always too hot for me . . . After playing the first year at (Metropolitan Stadium) and then coming in here, I feel like we lost a little bit of an edge that we had over teams that had to come and play us, and I don’t think I’m alone in that feeling." RANDLE: "I think we were getting ready to play the Packers in the Metrodome and Bernard Dafney, an offensive tackle, it was funny because he goes in the bathroom and he’s got on his cleats on, he’s got his pants on, he’s got his jersey on and he goes in the bathroom and about two minutes later, all of a sudden, he breaks the toilet seat. And the locker room, everybody was all quiet in the locker room, all of a sudden you just hear this big crash, boom, boom, boom. You turn and all of a sudden he comes out and says, ‘Man I broke the toilet seat.’ And he’s standing there, he’s taking his pants off and he still has his shoes on and you hear that click-clack noise, click, clack, ‘I broke the toilet seat.’ He comes out and he’s standing there. And everybody just broke out into a huge laughter and we went out and beat the Packers, and that was one of the moments you knew we were going to win the game just from that moment breaking that toilet seat." ALLEN: "I’m just hoping to get a place that has hot water. We have one shower with hot water down there. There’s a line waiting to get a shower." WILLIAMS: "I can’t say I’ll sit in my room in a dark place and cry about it. It could have used some upgrading a long time ago, but that’s your home and you have to embrace it, take what you have . . . sometimes (the showers) play tricks on you. I think it had a mind of its own sometimes. If we didn’t play so well, might end up with a cold shower after the game. Won’t miss that." LONGWELL: "There are better facilities, but it’s one of those things where the car that’s a couple years old, almost looks dated. But when it becomes 10, 15 years old it almost becomes a little emotional attachment. And I think has that vintage quality to it where yeah, the locker room is small. The equipment area is small, the showers are small, but it kind of has that vintage, you’ve been here for so long to make it work. It was fun to go on a run like we did in ’09 and make this building rocking and get that thing going. It’s a special place. It will be sad to see it go." RANDLE: "It was home. To me it was one of the best places to play. I got my 100th sack against Troy Aikman in the Metrodome. To me, there’s so many memories in the Metrodome. To me it was like an old family car, the Metrodome. Everybody who played there would use the family car and have wonderful memories of the Metrodome. It’s sad to see it go, but at the same time, the new stadium is going to be a welcome thing for the Twin Cities." For some, the memories started long before they ever donned a purple Vikings’ helmet. Linebacker CHAD GREENWAY (2007-present), from South Dakota: "Probably the single best (memory) would be my first Twins game or winning the Big Ten title in college. It was ’91, the year (the Twins) ended up winning the World Series, I saw them play the Angels. It was my first-ever professional sporting event. My dad brought me up here." Center MATT BIRK (1998-2008), who grew up in the Twin Cities: "It’s really the only stadium I’ve ever known; born in ’76. I can remember my sixth birthday. We loaded up a couple of station wagons and all the neighborhood kids to a Twins game at the Metrodome and we thought it was the coolest thing ever. I went to Timberwolves games there, the first two years they were in existence they played in the Dome, $3 seats and sit in the upper deck and not be able to see anything. I got to play for the Vikings. I’ve got tons of memories wrapped up in that place. As much as people complain about it, and certainly I guess time might have passed it by a few years ago, it’s our stadium, my stadium. I’ll miss it." RANDLE: "One of my favorite memories is actually playing against my brother (Ervin Randle) my rookie year at the Metrodome. Coming out on the field and seeing my brother out there. First time I played against him in major sports and it happened at the Metrodome. So that would be one of my fondest memories. BIRK: "Probably my fondest memory will be of the parking lot after home games, going out there and my parents — I might be able to finagle an extra parking spot in the players’ lot — my parents would park in there and have a big spread after the game. It was just kind of everyone we knew who was at the game that’s where we’d be after games hanging out, beautiful fall afternoons. Especially after a win, it was a special time." The Metrodome, due to be torn down starting in January, will always holds special memories for those that defined the Metrodome era. MOSS: "One memory is the night that we honored Walter Payton. I think it was Monday Night Football and the Dome was rocking. I ended up getting fined for having No. 34 on my little towel. It was just a memorable night, I think it was a Monday Night Football game and we went crazy as a whole team. That’s one. Two is all the Packers games, especially early in my career when it really meant something when the Packers were still good, the Vikings were good and the game at Lambeau was good. But the Metrodome game was so hyped that people were having earplugs in. Against the Denver Broncos, the flip over my shoulder to Moe Williams ending the half and I think the last one would have to be how I used to jump up into Sid the Viking. That’s about it. There was just a lot of great memories there. I used to score the touchdown and hand the ball to a disabled kid, or somebody in the ropes, security ropes. It was just always a nice atmosphere from the warmups all the way to the end of the game. Running back ADRIAN PETERSON (2007-present): "Oh man, my first game, my first real touchdown, which was a pass. Clinching the playoffs last year, 296 (yards, the NFL’s single-game record), there’s so many great memories in the Metrodome. So, just look to add a couple more before we end the season." Safety JOEY BROWNER (1983-91): "Establishing the first nine years of its existence and then establishing a defense again because the ‘Purple People Eaters’ were outside. So when we came inside, to be able to change that and establish that was tremendous." MCDANIEL: "Some of my fondest memories are playing my first game in the Dome. First time I started in the NFL it happened to be in the dome against the New England Patriots. I was more worried about falling on the turf coming out, didn’t want to be embarrassed everybody seeing me go down. That first game, our 15-1 season we had in 1998, even though we didn’t finish it off well, the way we played and the way we all came together for that year. I was there for the big Herschel Walker trade and the first game that he played for us, 134 yards rushing, coming out of his shoe against Green Bay. That was a fun one. Even when I left the Vikings, when I went to Tampa my last two years, coming back to play in the Dome, just hearing the fans cheer, letting me know they appreciate what I did while I was there and to hear them just cheer as loud as they could against us when we were on the field. That was fun. That was a blast." Defensive end BRIAN ROBISON (2007-present): "Obviously you always have to think back to the playoff games that we’ve had here. It truly is just a great home-field advantage for us. We haven’t played as well there as we’d like to lately, but it’s always been one of the loudest stadiums in the league. We appreciate our fans coming in and doing what they do." RANDLE: "It was like playing in your backyard in front of your friends and family. That’s what it was like playing in the Metrodome because you felt as if everybody in Minnesota knew you and like they had known you for years. Every time I played there, it just felt like you, felt like home, but felt like you’re playing in your backyard because it was just a thrill to see the respect and love that you would receive in the Metrodome. To me, I felt so comfortable playing there because you just knew the opposing team would be at a disadvantage because of how much respect we got there and how much they love the team." DOLEMAN: "I guess my favorite memory is being able to make big plays on your home field, be it the last game I played, we were playing Green Bay, where I went over 150 sacks, forced fumble and all the whole thing against Green Bay. That was special. Playing any of the division rivals and making plays. When (Bears coach Mike) Ditka came in and called it the ‘Rollerdome.’ We lit it up that day with eight or nine sacks against those guys and ran them out the building. Those memories always step to the forefront of your mind when you think back on it." ALLEN: "I’ll never forget that first playoff game when I got here in ’08 against Philly. Even though we lost that game, it was crazy loud. The two playoff games against Philly and Dallas were great. The Monday Night Football game I had against Green Bay will be a moment I always remember in my career. That whole 2009 season was phenomenal. That catch in the back of the end zone that Greg Lewis made, he had just got here. We were smashing the Niners, they came back, and all of a sudden, to end the game like that, that was pretty memorable. There’s been so many great memories. When I got my 22nd sack, we were (3-12) at that time, the crowd was just, I mean, amazing. It was just energetic. There’s a lot of great memories." LONGWELL: "Probably that 50-yarder to beat the Giants at the gun to win the division and send us into the playoffs. That was huge. The first field goal I attempted in the preseason when it was quiet; that was really weird for me to have it quiet. But then I threw a touchdown pass here and kicked the game-winner in that game. Just a lot of good memories. Obviously that ’09 year, beating the Packers here and having the whole world watching was pretty special." Punter CHRIS KLUWE (2005-12): "Just a lot of great games we had here. I think beating the Cowboys in the playoffs, that was a lot of fun, because that was just a dominant game that I don’t think a lot of people expected us to be that dominant. We won a lot of games here. Brett (Favre’s) throw to Greg Lewis in that San Francisco game, that was pretty amazing. Just stuff like Ryan’s game-winner against the Giants where we got iced three times — by our own team — that was pretty good. Just stuff like that." BIRK: "As much as people have ripped it the last 10 years or so, look at that place. $50 million to build, Vikings, Twins, couple World Series, NFC championship, Final Fours, Super Bowl hosted there, Gophers, everything that took place in that building, are you kidding me? It’s pretty amazing. There will never be another building like that, that has that many events over the course of its lifetime. It’s just not the way they do stadiums anymore. Everybody’s got to have their own. Pretty amazing multi-function use building if you think about it."